"... a palpable undercurrent of sensuality rippled through "Chana’s Story," ... The mezzo-soprano Re’ut Ben-Ze’ev, accompanied by Mr. Del Tredici at the piano, offered a bold, committed account - "portrayal" might be a better word, so deeply physical was her performance - in songs that dealt with nascent romance and motherhood, as well as dwindling passion, loss and renewed independence." "... The intensity of the taped collage was enhanced when Re’ut Ben-Ze’ev stepped on stage to sing an impassioned song... "
"... Israeli Soprano Re’ut Ben-Ze’ev expressed with exactitude Love as a ground for pain and joy ... With intense expression and pure voice she ignited fireworks." "Having studied theatre prior to singing, Re’ut Ben-Ze’ev’s on-stage fascination is not for the ear alone." "... the wonderful singer Re’ut Ben-Ze’ev - with the most convincing and emotionally and vocally masterful performance ... Ms. Ben-Ze’ev’s performance-so theatrical and so right. This half hour piece is a musical tour de force, Ms. Ben-Ze’ev whose reputation is growing, outstanding vocally and theatrically. Bravi!" "The songs benefited from Re’ut Ben-Ze’ev’s singing. Her sensitivity in regard to the richness and the colourfulness of these four gorgeous songs was apparent throughout the whole piece. Ben-Ze’ev left a desire to hear her in a completely different repertoire as well ..."
"Re’ut Ben-Ze’ev in clear plastic mules and a cocktail dress joins her to sing Dikla’s song. She strides about the space: a vivid presence with a lusty, rich soprano voice." "...[her] intense performance ... revealed Nuptial Scene to be an appealing work of art music ..."
"... Re’ut Ben-Ze’ev gave a brilliant vocal and acting performance. Her efforts were spirited and convincing as she deified the male body ... as the piece progressed she captured the helplessness of a woman falling out of love, and had the audience hanging on every word by the last movement, which ended with the sadness of loss, but also hope contained in the possibility of change." "... Richman’s opus was especially striking because it began with Ben-Ze’ev’s deliberate singing of ‘Where shall I go’." 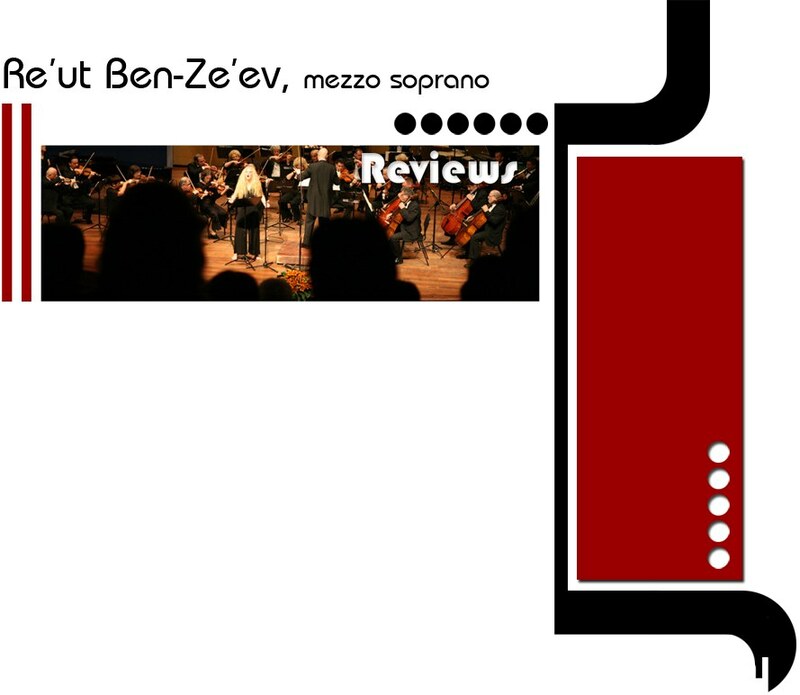 "... Re’ut Ben-Ze’ev is a very musical singer with a distinct voice ... Never does Re’ut make sound for sound’s sake - a refreshing quality in a singer, indeed." "She has an important voice ... a naturally beautiful, warm voice and I really prize her." "... exceptionally gifted ... highly imaginative and extremely intuitive."